•Enterprise is an ultimate legal holding company. •Enterprise is mandatory and serves as an umbrella for the entire implementation and all organizations are created within an enterprise. Here Divisions is Based on the Country (or) Based on the Companies also. •Business function logically indicates a presence of a department in the business unit with people performing tasks associated with these business functions. 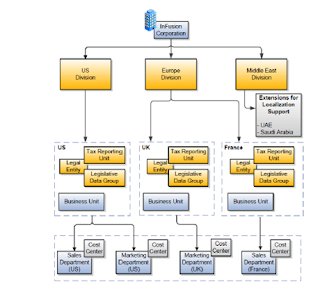 •Optionally, you can define a hierarchy of divisions, business units, and departments as a tree over HCM organization units to represent your enterprise structure. •When a business function produces financial transactions, a business unit must be assigned to a primary ledger, and a default legal entity. Legal Entities is nothing but a Organization. Where we want to Business Legally. Legal Entity is nothing but where we register our company for the purpose of social insurance and payroll related information. •Required to publish specific and periodic disclosures of your legal entities‘ operations based on different jurisdictions' requirements. •Your legal entities can be identified as legal employers and therefore, are available for use in Human Capital Management (HCM) applications. •Frequently, a business unit is part of a single legal entity. •Division is an area of management responsibility that can correspond to a collection of legal entities. •Divisions and legal entities are independent concepts. RDS Means Reference Data Sets. It will Shares The Information Across The Business Units. * Information Like 1). Locations. •Positions are not set enabled but are defined within a Business Unit. •After you create your enterprise structure, you also follow a guided process to determine whether or not to use positions, and whether to set up additional attributes for jobs and positions. •After you define your enterprise structure and your job and position structures, you can review them, make any necessary changes, and then load / rollback the final configuration. •Rollback an enterprise configuration after loading it.